Hesse or Hessia (German: Hessen , Hessian dialect: Hesse ) is both a cultural region of Germany and the name of an individual German state. The cultural region of Hesse includes both the State of Hesse and the area known as Rhenish Hesse (Rheinhessen) in the neighbouring Rhineland-Palatinate state. The oldest city of the cultural region of Hesse, Mainz, is in Rhineland-Palatinate. The State of Hesse (German: Land Hessen) is part of the larger cultural region. It has an area of 21,110 km2 (8,150 sq mi) and just over six million inhabitants. The capital is Wiesbaden. Hesse's largest city is Frankfurt am Main. The English name "Hesse" comes from the Hessian dialects. The variant "Hessia" comes from the medieval Latin Hassia. The German term Hessen is used by the European Commission because their policy is to leave regional names untranslated (paragraphs 1.31 & 1.35). The term "Hesse" ultimately derives from a Germanic tribe called the Chatti, who settled in the region in the first century B.C. An inhabitant of Hesse is called a Hessian (German: Hesse (masculine) or Hessin (feminine)). Hessian mercenaries played a prominent role in the American War of Independence. The synthetic element Hassium, number 108 on the Periodic Table, is named after the state of Hesse. As early as the Paleolithic period, the Central Hessian region was inhabited. Due to the favorable climate of the location, people lived there about 50,000 years ago during the last glacial period, as burial sites show from this era. Finds of paleolitical tools in southern Hesse in Rüsselsheim suggest Pleistocene hunters about 13,000 years ago. The Züschen tomb (German: Steinkammergrab von Züschen, sometimes also Lohne-Züschen) is a prehistoric burial monument, located between Lohne and Züschen, near Fritzlar, Hesse, Germany. Classified as a gallery grave or a Hessian-Westphalian stone cist (hessisch-westfälische Steinkiste), it is one of the most important megalithic monuments in Central Europe. Dating to the late 4th millennium BC (and possibly remaining in use until the early 3rd), it belongs to the Late Neolithic Wartberg culture. An early Celtic presence in what is now Hesse is indicated by a mid 5th century BC La Tène style burial uncovered at Glauberg. The region was later settled by the Germanic Chatti tribe in ca. the 1st century BC, and the name Hesse is a continuation of that tribal name. The Ancient Romans had a military camp in Dorlar, and in Waldgirmes directly on the eastern outskirts of Wetzlar was a civil settlement under construction. Presumably, the provincial government for the occupied territories of the right bank of Germania was planned at this location. 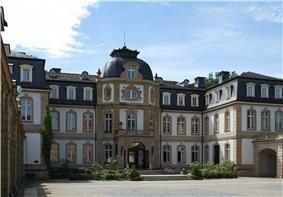 It is likely that the governor of Germania, at least temporarily, had resided here. The settlement appears to have been abandoned by the Romans after the devastating Battle of the Teutoburg Forest failed in the year 9 AD. The Chatti were also involved in the Revolt of the Batavi in the year 69 AD. In the early Middle Ages, a Frankish gau comprising an area around Fritzlar and Kassel and a Saxon one further north were known as Hessengau. In the 9th century the Saxon Hessengau also came under the rule of the Franconians. In the 12th century it was passed to Thuringia. In the War of the Thuringian Succession (1247–64), Hesse gained its independence and became a Landgraviate within the Holy Roman Empire. It shortly rose to primary importance under Landgrave Philip the Magnanimous, who was one of the leaders of German Protestantism. After Philip's death in 1567, the territory was divided up among his four sons from his first marriage (Philip was a bigamist) into four lines: Hesse-Kassel (or Hesse-Cassel), Hesse-Darmstadt, Hesse-Rheinfels and the also previously existing Hesse-Marburg. As the latter two lines died out quite soon (1583 and 1605, respectively), Hesse-Kassel and Hesse-Darmstadt were the two core states within the Hessian lands. Several collateral lines split off during the centuries, such as in 1622, when Hesse-Homburg split off from Hesse-Darmstadt. In the late 16th century, Kassel adopted Calvinism, while Darmstadt remained Lutheran and subsequently the two lines often found themselves on different sides of a conflict, most notably in the disputes over Hesse-Marburg and in the Thirty Years' War, when Darmstadt fought on the side of the Emperor, while Kassel sided with Sweden and France. The Landgrave Frederick II (1720–1785) ruled as a benevolent despot, 1760-1785. He combined Enlightenment ideas with Christian values, cameralist plans for central control of the economy, and a militaristic approach toward diplomacy. He funded the depleted treasury of the poor nation by renting out 19,000 soldiers in complete military formations to Great Britain to fight in North America during the American Revolutionary War, 1776-1783. These soldiers, commonly known as Hessians, fought under the British flag. For further revenue the soldiers were rented out elsewhere as well. Most were conscripted, with their pay going to the Landgrave. Hesse-Kassel was elevated to the status of an Electorate in 1803, but this remained without effect as the Holy Roman Empire was disbanded in 1806. The territory was annexed by the Kingdom of Westphalia in 1806, but restored to the Elector in 1813. While other Electors had gained other titles, becoming either Kings or Grand Dukes, the Elector of Hesse-Kassel alone retained the anachronistic title. The name survived in the term Kurhessen, denoting the region around Kassel. In 1866, it was annexed by Prussia, together with the Free City of Frankfurt, Hesse-Homburg and the duchy of Nassau, which established the province of Hesse-Nassau. Hesse-Darmstadt was elevated to the status of a Grand Duchy in 1806, becoming the Grand Duchy of Hesse. In the War of 1866, it fought on the side of Austria against Prussia, but retained its autonomy in defeat. This is because a greater part of the country was situated south of the Main river and Prussia did not dare to expand beyond the Main line, as this might have provoked France. However, the parts of Hesse-Darmstadt north of the Main river (the region around the town of Gießen, commonly called Oberhessen) were incorporated in the Norddeutscher Bund, a tight federation of German states, established by Prussia in 1867. In 1871, after France's defeat in the Franco-Prussian War, the rest of the Grand Duchy joined the German Empire. Around the turn of the twentieth century, Darmstadt was one of the centres of the Jugendstil. 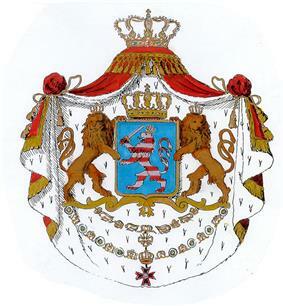 Until 1907, the Grand Duchy of Hesse used the Hessian red and white lion as its coat-of-arms. The revolution of 1918 transformed Hesse-Darmstadt from a monarchy to a republic, which officially renamed itself "Volksstaat Hessen" (People's State of Hesse). The parts of Hesse-Darmstadt on the western banks of the Rhine (province Rheinhessen) were occupied by French troops until 1930 under the terms of the Versailles peace treaty that officially ended WWI in 1919. After World War II the Hessian territory left of the Rhine was again occupied by France, whereas the rest of the region was part of the US occupation zone. The French separated their part of Hesse from the rest of the region and incorporated it into the newly founded state of Rhineland-Palatinate (Rheinland-Pfalz). The United States, on the other side, proclaimed the state of Greater Hesse (Groß-Hessen) on 19 September 1945, out of Hesse-Darmstadt and most of the former Prussian province of Hesse-Nassau. 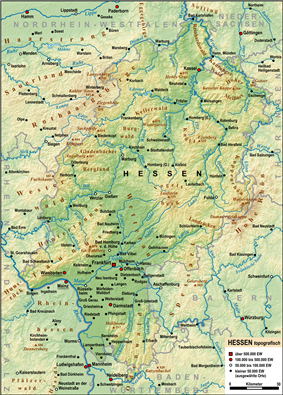 On December 4, 1946 Groß-Hessen was officially renamed Hessen. Situated in west-central Germany, Hesse state borders the German states of (starting in the north and proceeding clockwise) Lower Saxony, Thuringia, Bavaria, Baden-Württemberg, Rhineland-Palatinate and North Rhine-Westphalia. The most important rivers in Hesse are the Fulda and Eder rivers in the north, the Lahn in the central part of Hesse, and the Main and Rhine in the south. The countryside is hilly and there are numerous mountain ranges, including the Rhön, the Westerwald, the Taunus, the Vogelsberg, the Knüll and the Spessart. Most of the population of Hesse is in the southern part of Hesse in the Rhine Main Area. The Rhine borders Hesse on the southwest without running through the state, only one old arm – the so-called Alt-Rhein – runs through Hesse. The mountain range between the Main and the Neckar river is called the Odenwald. The plain in between the rivers Main, Rhine and Neckar, and the Odenwald mountains is called the Ried. Rhenish Hesse (German: Rheinhessen) refers to the part of the former Grand Duchy of Hesse-Darmstadt located west of the Rhine river and now part of Rhineland-Palatinate. It is a hilly countryside largely devoted to vineyards; therefore, it is also called the "land of the thousand hills." Its larger towns include Mainz, Worms, Bingen, Alzey, Nieder-Olm and Ingelheim. Many inhabitants commute to work in Mainz, Wiesbaden, or Frankfurt. Rhenish Hesse contains a number of municipalities and has no specific overall government. It was previously part of the government area of Rheinhessen-Pfalz. However, the state of Rhineland-Palatinate no longer uses this area for administrative purposes. The Politics of Hesse takes place within a framework of a federal parliamentary representative democratic republic, where the Federal Government of Germany exercises sovereign rights with certain powers reserved to the states of Germany including Hesse. The state has a multi-party system where the two main parties were long the center-right Christian Democratic Union (CDU) and the leftist Social Democratic Party of Germany (SPD). However, this changed in 2009, when support for the SPD collapsed after a political crisis in 2008. There are now five parties in the Hesse Landtag. Although the government under Minister-President, Roland Koch (CDU), lost their majority in the state diet Landtag of Hesse following the 2008 Landtag election, their rival parties were unable to form a government. A snap election was held in 2009, which enabled the CDU again to form a government with the FDP. In May 2010, Koch announced his resignation from the post of Minister-President as well as his retirement from politics. His successor is Volker Bouffier. Turnout was at 61.0%, down from 64.3% in 2008. 61.0% marks the lowest turnout for a Landtag election in Hesse's history. Only the non-binding 1946 election (while Hesse was still under military occupation) had a lower turnout. The cultural region of Hesse extends into Rhenish Hesse which is in Rhineland-Palatinate. The oldest city of the cultural region of Hesse, Mainz, is in Rhenish Hesse. The locals speak a Rhine Franconian dialect known as Hessisch. 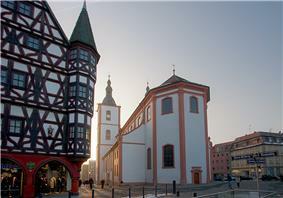 View of the Stadtpfarrkirche St. Blasius in Fulda. In 2013 Christianity was the most popular religion in the state. 40% of the Hessians belonged to the Protestant Church in Hesse and Nassau or Evangelical Church of Hesse Electorate-Waldeck (members of the Evangelical Church in Germany), 25% adhered to the Roman Catholic Church, while other Christians constituted some 2%. The remaining one third of the Hessian population were Muslims or belonged to other faiths, or is unaffiliated. The continental Baha'i House of Worship for Europe is located in the village of Langenhain in the town of Hofheim near Frankfurt. The official anthem of Hesse is called "Hessenlied" (Song of Hesse), and was written by Albrecht Brede (music) and Carl Preser (lyrics). Hessischer Rundfunk (HR) is the main ARD broadcaster in Hesse, providing a statewide TV programme as well as its regional radio stations (HR 1, HR 2, HR 3, HR 4, you fm and HR info). Other than HR, ZDF and other privately run TV stations flourish. Among the commercial radio stations that are active in Hesse are Hit Radio FFH, Planet Radio, Harmony FM, Radio BOB and Main FM. 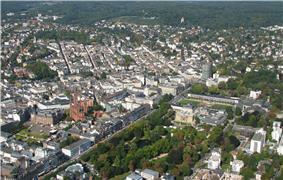 Hesse is one of the largest and healthiest economies in Germany. Its GDP in 2013 exceeded 236 billion Euros (about 316 bn US$). 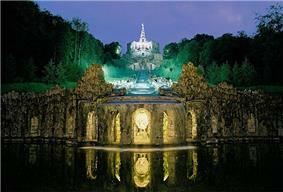 This makes Hesse itself one of the largest economies in Europe and the 38th largest in the world. According to GDP-per-capita figures, Hesse is the wealthiest State (after the City-states Hamburg and Bremen) in Germany with approx. $52.500 US. The Rhine-Main Region has the largest industrial density after the Ruhr area in Germany. The main economic importance are the chemical and pharmaceutical industries with Sanofi-Aventis, Merck KGaA, Heraeus, Messer Griesheim and Degussa. In mechanical and automotive engineering is Opel in Rüsselsheim worth mentioning. 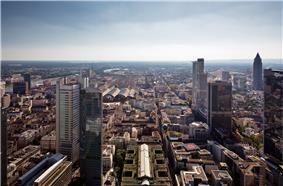 Frankfurt as a financial center is crucial. The European Central Bank and the Deutsche Bundesbank headquarters there. Besides the headquarters of the Deutsche Bank, Commerzbank, KfW Bank, DZ Bank and numerous smaller banks, but also the offices of many foreign banks around globe. Frankfurt is also the most important German stock exchange with the Frankfurt Stock Exchange. Insurance companies have settled notably in Wiesbaden. The city's largest private employer, with about 3,900 employees, the R+V Versicherung also the DBV-Winterthur, the SV SparkassenVersicherung and the Delta Lloyd Group. The leather industry predominantly is settled in Offenbach. Frankfurt Airport is the largest employer in Germany with more than 70.000 employees. Outside the Rhine-Main region in Wetzlar companies are located with an international reputation. There the center of the optical, electrical and precision engineering industries Leitz, Leica, Minox, Hensoldt (Zeiss) and Buderus and Brita with several plants in central Hesse. In the east Fulda have a rubber plant (Fulda Reifen). In northern Hesse the Volkswagen AG has a huge factory in Baunatal for spare parts. In Kassel settles Bombardier with a large plant for Locomotives. Hesse has one of the best transportation networks in Europe. Many trans-European and German motorways, high-speed train, and waterways lines cross Hesse. Frankfurt International Airport is Germany's largest and Europe's third-largest airport (after London Heathrow and Paris Charles de Gaulle). Frankfurt (Main) Hauptbahnhof is Germany's second-busiest railway station by passengers but the busiest in terms of traffic. Frankfurt Airport is by far the largest airport in Germany with more than 57 million passenger each year and among the world's ten largest. Not far of the Airport towards south is the Frankfurt Egelsbach Airport which is frequented by general aviation-planes. The DFS (German air traffic control) has its headquarters in Langen. Situated in Northern Hesse Kassel Calden Airport, whose expansion is planned, has however only regional importance. There are also a number of sports airfields. Low-cost airlines, especially Ryanair, uses Frankfurt-Hahn Airport as a major base. The airport is actually located about 100 km from Frankfurt in the neighbor state of Rhineland-Palatinate. The Hessian constitution was written in 1946, and Article 21 permitted the use of the death penalty. But all uses of capital punishment in Germany are forbidden by the 1949 Federal Grundgesetz (basic law), which supersedes all state laws such as the Hessian constitution by the principle of "Bundesrecht bricht Landesrecht" ('Federal law breaks state law'). There is still public discussion in Hesse about removing the now useless text concerning death penalty from the Hessian constitution: Some people think that Article 21 of the Hessian constitution should be deleted, for if there is no death penalty it cannot be used. Removing the death penalty from the Hessian constitution, however, requires a referendum in Hesse. Bavaria held a referendum in 1998 and successfully removed the law concerning death penalty from its constitution, and the Saarland removed the passage concerning the death penalty upon reunion with Germany in 1956. ^ "Die Bevölkerung der hessischen Gemeinden". ^ "Bruttoinlandsprodukt". Volkswirtschaftliche Gesamtrechnungen (in Deutsch). Hessisches Statistisches Landesamt. 2013. Retrieved 27 March 2014. ^ "Hessen - 60 stolze Jahre - Zeittafel 1945/1946". Retrieved 2006-12-01. ^ a b "Our State". State of Hesse. Retrieved 14 April 2011. ^ "Bruttoinlandsprodukt". Volkswirtschaftliche Gesamtrechnungen (in Deutsch). Hessisches Statistisches Landesamt. 2012. Retrieved 27 March 2013.